Union Cultural Center was founded in 2010 with a mission to provide an experiential education space for teaching, sharing, and creating vibrant culture. The International Capoeira Angola Foundation originally established the space as a means to create a "home" for classes and events and began growing the UCC community, beginning with long time friends and fellow artists, Dora Oliveira and Manimou Camara. 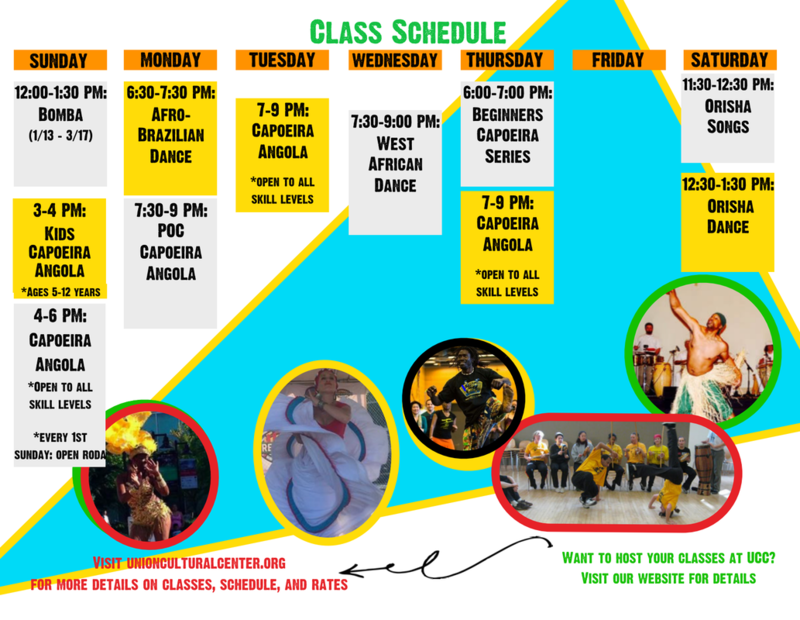 Our space, located in the heart of Seattle's Chinatown/International District, is over 1000 square feet and hosts a variety of movement and music classes rooted in traditions of Brazil, West Africa, Puerto Rico and beyond. We are a warm and welcoming community space who would love to have you join our family of learners and teachers. The International Capoeira Angola Foundation (ICAF) was founded in 1995 by Mestre Cobra Mansa, Mestre Jurandir, and Mestre Valmir in order to cultivate, preserve and grow the Afro-Brazilian cultural art Capoeira Angola. The Seattle branch of ICAF was established in 1997 by Mestre Jurandir with the support of a small group of dedicated students. Housed in the vibrant space of the Union Cultural Center, our mission is to connect and empower the Pacific Northwest community through Capoeira Angola and cultural arts. The Seattle chapter is one of 29 ICAF groups around the world. *Donations made to ICAF benefit UCC programming and allow us to provide an inclusive, inviting place for cultural arts to thrive.